Although velvet painting dates back at least to the 14th century, (Marco Polo found velvet painting in Kashmir), the 20th century popularity of black velvet traces back to Leeteg, a native of Sacramento, California. In California, Leeteg did odd jobs, including sign painting, but jobs were scarce in the Depression. 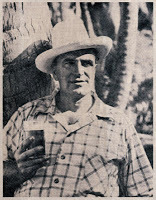 He emigrated to Tahiti in 1933 with a few brushes and paint left over from his sign work. There he painted sensuous portraits of the local women and of orchids and started selling his paintings to tourists in bars. He eventually found patrons in America and a dealer in Hawaii. Many of his customers were Navy personnel based in Hawaii who brought the paintings back to their base in San Diego. With Leeteg’s originals under their arm, many of these sailors went to Tijuana to commission similar portraits of their girlfriends. After that, black velvet painting developed into a small industry of handcrafted art for tourists which continues to this day. The Mexican subjects tended more to bullfights, señoritas, and celebrities. Leeteg’s originals have gone up and down in value with collectors. They have remained popular with fans of Tiki / Polynesian art of the 1940s, and with tastemakers who embrace kitsch culture.